Life Without Toiletpaper - Bum Deal? Home » Frugal Living » Lifestyle » Life Without Toiletpaper - Bum Deal? Upon reading the New York Times article about the Beaven-Conlin household in Manhattan, I started to get a little queasy. The article delves a bit into the lives of a couple and their young daughter, yuppies who live affluent lives in New York City. They've taken the idea behind The Compact, and then taken it a LOT farther. They are trying to live for one year with absolute minimal impact on the environment. Their toddler wears organic cotton diapers. The family eats all organic food, grown within a 250-mile radius of the city. They bake their own bread, take the stairs instead of the elevator, and don't buy much outside of groceries. That sounds responsible, right? Then it gets better. They don't use toilet paper (the details of how they avoid this are not pretty, and no, they did not have the good sense to invest in a bidet). They compost INSIDE their apartment. They use no spices but have made an exception for salt, which they apparently think of as an indulgence in baking rather than something that humans need in order to survive. I think that the idea behind what the Beaven-Conlin family is trying is wonderful. And even though we all agree that we should use less, buy less, and pollute less, how many of us really do much of anything to accomplish this? The dishwasher is off, along with the microwave, the coffee machine and the food processor. Planes, trains, automobiles and that elevator are out, but the family is still doing laundry in the washing machines in the basement of the building. And they have not had the heart to take away the vacuum from their cleaning lady, who comes weekly (this week they took away her paper towels). I consider myself an environmentalist, but I just ate a sandwich out of a styrofoam container and then threw it away, because you can't recycle styrofoam in Seattle and I got tired of hauling bags of it to my parents' place across the mountains for recycling. I drive 20 miles to work, because my job is located quite far from the job that I had when I bought my home (telecommuting is not an option with this firm, and taking the bus would take me close to 2.5 hours each way). If there is anyone who eats food grown farther from where they live, I don't know who it could be. I have a ridiculous appetite for tropical fruit and exotic spices. In the NY Times article, Colin Beaven states that the experiment that his family is trying is "also very urban. It’s a critical twist in the old wilderness adage: Leave only footprints, take only photographs. But how do you translate that into Manhattan?" Well, I'd argue that that's easier in Manhattan than a lot of other places. Because Manhattan is rife with foodies, you can find farmers markets open year-round. You can buy organic milk in reusable glass bottles. There aren't many places in the five boroughs that you can't walk or bike to. I used to live in Brooklyn and work in Chelsea, and I would walk from dinner with friends in Midtown back home. It took a while (and wasn't always voluntary; sometimes I'd run out of money and not be able to get subway fair), but it was very doable. Come to think of it, I never went to Staten Island, so maybe you can't get there by bike or on foot. People who live outside of large metropolitan areas with stellar public transportation (you know, normal people who can't afford huge apartments, or even studios, in swanky downtown areas) don't have the luxury of riding their Razor scooters to work. Not only would that be impossible, but they'd probably get their butts kicked by their work buddies. Hell, my neighbors are very swishy, and I think they'd probably call me a sissy if I broke out a Razor scooter and started scooting around Seattle. Now, the No Impact Family is not saying that everyone else has to live like this, and they are obviously trying it as an experiment. I think these kinds of revolutionary try-it-and-see experiments are brilliant, and I certainly applaud their efforts, even if I think the lifestyle might be too extreme for many of us (I am NOT making my own vinegar, thank you). Also, I think some of the moves are a little odd. For instance, Ms. Conlin takes her lunch to work every day in a mason jar. What's wrong with Tupperware? Yes, it's plastic, but it's not like you throw it out. A mason jar is heavy and awkward and breakable. I love using mason jars for preserves and pickles, but it's not up there on my list of potential lunchboxes. Why stop at a mason jar? Why not just put your lunch in a soapstone box that you carved yourself and tie it up in leather than you tanned out of from Central Park squirrel hides? Think of the shoulder muscles you'd develop! Also, she gave up coffee. Well, that's just plain sick. I mean, if you don't want to go to Starbucks or even an independent coffeshop every day, that's fine. But there's nothing wrong with a French press. It's French! The French love suffering (or is that Russians? ), so it totally fits in with the lifestyle. Ms. Conlin... did describe, in loving detail, a serious shopping binge that predated No Impact and made the whole thing doable, she said. “It was my last hurrah,” she explained. It included two pairs of calf-high Chloe boots (one of which was paid for, she said, with her mother’s bingo winnings) and added up to two weeks’ salary, after taxes and her 401(k) contribution. What? You know, maybe these people really need to try this. I don't know how much Conlin makes at Business Week, because she could be an intern, but I'm guessing from her apartment location and her good taste in boots that that was pretty much a $3000 shopping spree. That's a guess, yes, but still. Two weeks salary? Doesn't something like that sort of defeat the purpose of no impact living? Perhaps I'm being too touchy on the subject because I realize that if I used one-tenth of the discipline that this family is showing, I could make a major impact on my life, but by golly, I hate the stairs. And bidets are really, really pricey. You lost me at inside! Stories like these do make me feel a little bit weak willed. "they'd probably call me a sissy if I broke out a Razor scooter and started scooting around Seattle." If they don't, I will. Pointing and laughing. Yup. Since we've never met, I'm only assuming that you are in fact the beefy, masculine, NASCAR-watching, beer-can-on-the-forehead crushing, studly stud that you say you are in your profile. But if your email alias is any indication, I would SO beat you in an arm wrestling match. I think it's because my email address is i-have-small-arms@wisebread.com. But the article mentions the sour smell in their apartment. I can imagine doing it if I had a spare closet with killer ventilation that I kept my sports equipment in. If I had sports equipment, which I don't. I do admire that they are trying so hard to make this experiment work. about 4 billion people don't use toilet paper. big whup. breathing causes a major impact on the environment..(draw your own conclusion). Also, isn't having a compost inside the apartment unhealthy? Shouldn't CPS be called to save that child? I've never traveled anywhere in which people didn't use SOMETHING to wipe. If you live ina rural area of the Third World, it might be leaves, and you'll probably be going over a pit with a couple of boards across it. 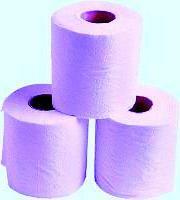 If you live in a city in Kenya, India, or China, then you use toilet paper. You might not be able to flush it down the toilet, but you use it. Indoor compost is actually quite common. I don't know how this couple is doing it, but it shouldn't smell if you do it right. It's usually done in a large plastic bin with a cover, usually under the sink. Also, the article says she's a senior writer at Business Week, so I would assume that was a substantial shopping spree. - using natural diapers means you need to wash them. And kids use a lot more of them (compated to classic paper pamers) since they do not have that large capacities in holding liquids. What is the total eco-banalce if you consider electricity, water and washing powder use? - baking your own bread: I assume they use their home electric/gaz oven... what is the energy efficiency of heating up the whole oven to bake just one bread compared to a high-scale commercial one? - microwave: I use it a lot for quick heating up liquids (soups, milk, tea, etc) - for economic reasons - microwave heats up only the liquids you put in, it does not heat up air, pans, metal parts - all of the energy is transmitted direclty into the soup... why should I start to use back my electric kitchen? - speaking of me, I do not consider myslef environmentalist, but I bike to my work and with my kid to his kindergarden, I actually turn off light when leaving a room and use predominantly low enegy light-bulbs, I do not use pastic bags (do not use any bags... just a folding plastic box) - just because it all just makes sens to me (biking = faster, turning-off = cheaper, folding box = more handy). But I still live in a western country - with all its power consumption these all my small contributions are simply not worth mentioning when compared to how much enerty is needed to sustain our 'quality-of-life' (when all services are included into equation)! If someone wants to leave just footprints, and he or she means it, then should move out to Africa and try to live for $1 a day... are we willing/capable of doing this? I am not, and this is why I do not consider myself environmentalist. I don't think I or anyone who commented here is worshiping the Manhattan couple. PErhaps impressed by their dedication, but I haven't heard anyone coming close to anything like 'worship'. I agree that they may not be making as big an impact as they like to think, but they're still doing a lot more than most people. I also admire that you bike to work - I wish that that were a feasible option for most of us. Moving to Africa and living on less than a dollar a day is not exactly helpful to anyone. Sure, the impoverished people of this world may create less of a "carbon footprint" than I or other yuppies do, but the solution is not the scale back to the point of switching continents. The spirit of it is to do the most you can. What if all of us did what this Manhattan family is doing? What if it were possible for half of my city to ride their bikes to work rather than to drive? In a way, I understand why this couple is going full-bore (or as full-bore as they can, given that they have jobs that require them to wear clean clothes). It forces them to REALLY do all this stuff. I might say to myself "You know, I should take the stairs", but half the time, when faced wih more than a couple of flights, I'll take the elevator. Taking on a huge experiment like this wouldn't let me forget my obligation. I had read that article also and I applaud what they are doing. I think you are a little hard on Ms. Conlin for her shopping spree. In the article, she did say that it was her husband's idea. It sounded to me like the shopping spree was one of her conditions she placed before agreeing to try no-impact living. Don't feel threatened by what they are doing. Don't feel self-conscious that there are people out there doing more than you. Instead, use them for inspiration, reflect on yourself, and maybe add a couple more pro-environment behaviors of your own. It's very difficult in America to be a full-blown environmentalist. The key is to find some balance. Do what you can within your limitations, then stretch yourself to see if you can do a little more. I'd be a whole lot more impressed if the only reason Colin started on his year-long no impact experiment wasn't the fact that there's a book deal involved and a documentary movie. It's all about the money. I don't believe for one minute that on day 366, life will be the same for Beavin-Conlin household. I used to feel the same way, but it's been over a year, and the Beavin-Conlin household is still at it. I will not even think about the comment #15 above. Also, she gave up coffee. Well, that's just plain sick. cloth diapers, but don't take away my (fair trade, shade grown, home brewed) coffee!! !